Seam carving is one of the most popular image scaling algorithms which can effectively manipulate the image size while preserving the important image content. 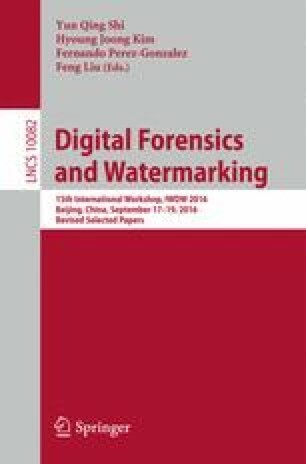 In this paper, we present a local derivative pattern (LDP) based forensic framework to detect if a digital image has been processed by seam carving or not. Each image is firstly encoded by applying four LDP encoders. Afterward, 96-D features are extracted from the encoded LDP images, and the support vector machine (SVM) classifier with linear kernel is utilized. The experimental results thus obtained have demonstrated that the proposed framework outperforms the state of the art. Specifically, the proposed scheme has achieved 73%, 88% and 97% average detection accuracies in detecting the low carving rate cases, i.e., 5%, 10% and 20%, respectively; while the prior state-of-the-arts has achieved 66%, 75% and 87% average detection accuracy on these cases.